As coaching trainer Peter DeWitt said in his blog 3 Reasons Instructional Coaching May Not Be Working, and as the Measures of Effective Teaching Project showed, badly done coaching can actually harm teachers’ performance. Despite educators’ best efforts, the majority of initiatives in schools today fail. Some estimates show failure rates as high as 70%. The main reason for this is poor implementation. Unfortunately, good intentions are not enough when it comes to driving and sustaining growth. A good place to start is pulling together an instructional leadership team (ILT) who can provide processes and quality control to ensure your coaching program and school improvement initiatives succeed. Sometimes called a School Improvement Team (SIT), School Leadership Team (SLT) or School Management Team (SMT), they are usually made up of coaches, mentors and other school leaders who work collaboratively to achieve key goals, making them vital to the success of any school improvement initiative. Here are four practical questions that you and your ILT can reflect on in order to build your instructional coaching programme, giving it the best possible chance of success. 1. Are your instructional coaching expectations aligned with existing priorities, curricular programs and school improvement goals? A common characteristic among the highest-performing schools is that all initiatives and processes work together. When systems are aligned and implemented well, instructional coaching can support and build momentum towards the school's larger goals for teaching and learning. Also, by ensuring that coaching works with existing efforts and towards a narrow set of shared goals, school leaders can strengthen existing initiatives instead of creating new ones. What is the vision for your instructional coaching programme? How does it align with whole school improvement goals? Are staff aware of the vision and committed to moving toward it? Are there other initiatives being implemented at your school that might complement or compete with your planned coaching activities? 2. How many coaches do you have and who is coaching them? Too often, schools have multiple coaches supporting a single teacher. While the quality of support provided by each coach may be great, the sheer quantity of advice and guidance is nearly impossible to apply. Try to limit the number of coaches one teacher has and have someone to convene and manage and coach the coaches themselves. 3. Are all your coaches clear on what effective instruction looks like? In order for instructional coaching to be truly effective, there must first be a clear and shared vision of what great coaching looks like among your coaches and other members of SLT. In many schools, it's not just coaches providing feedback, which means that sometimes teachers receive mixed messages and inconsistent support. Feedback that is calibrated around specific standards for coaching is more productive. 4. 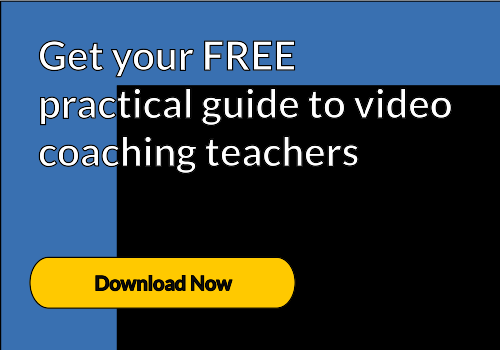 How can you use video to improve our teachers’ practice - as well as your own as leaders’? It’s common knowledge that one of the most powerful tools in coaching is using video to capture practice. Athletes have been doing this for decades and simply can’t live without reviewing their video after a practice or game. As Harvard’s Best Foot Forward study demonstrated, video has several benefits, including providing a common piece of evidence, more fair and productive observations, and increasing self-reflection. Video also allows for “anytime, any place, any pace” collaboration. Take Michelle Fritche for example. She was a struggling year 6 teacher in a deprived school with challenging children. She’d only been teaching for two years when she was graded as requires improvement. Her confidence took a huge knock and she started to question whether she was in the right job. With the help of a coach she began capturing her practice, reflecting on the teaching and learning and getting contextualised feedback in key areas. The results were amazing.